Denver Nuggets draft options: A look at 3 possible targets - Denverite, the Denver site! The Nuggets hold the 13th overall pick in addition to two second rounders (Nos. 49 and 51). Jun. 14, 2017, 1:32 p.m. Since the summer of 2014, there’s a case to be made that no NBA team has drafted better than the Denver Nuggets. Despite picking no higher than seventh in that three-year span, Denver has come away with a budding superstar in center Nikola Jokic, one of the most promising young shooting guards in the league in Gary Harris, a combo guard who showed flashes of greatness as a 19-year-old in Jamal Murray and a small forward who nailed more than 40 percent of his 3s as a rookie in Juancho Hernangomez. Nuggets general manager Tim Connelly and his staff have done a tremendous job of identifying talent, particularly toward the middle and back end of the draft. A week from Thursday, they’ll attempt to do it again. The Nuggets hold the 13th overall pick in addition to two second rounders (Nos. 49 and 51). Denver’s biggest need is a front-court player who can become an above-average defender at the NBA level. The Nuggets were the second-worst defensive team in basketball in 2016, hemorrhaging 110.5 points per 100 possessions. So with that in mind, here are three players I believe the Nuggets could choose with their first-round pick in next week’s draft. OG Anunoby has the chance to be a defensive monster in the NBA. Anunoby stands 6-foot-8, weighs 230 pounds and has a ridiculous 7-foot-2 wingspan. His combination of size and speed is rare. Those pterodactyl arms and ballerina feet helped him post elite steal and block rates in college, even when you compare him to other wing defenders like Kawhi Leonard, Paul George, Justise Winslow and Andre Roberson. It’s not hard to envision Anunoby turning into a screen-switching monster at the NBA level and locking down power forwards, points guards and everyone in between. The two big questions about Anunoby are his health — he tore his ACL in January — and his offensive game. Anunoby is a capable straight-line drive who can hammer on people at the rim. But the rest of his offensive game needs work. Anunoby doesn’t seem to have much confidence in his jump shot at this stage of his career. He attempted only 47 3s in 50 college games, making 36.5 percent of them. Even worse, Anunoby shot 52.2 percent from the free throw line at Indiana. His ball-handling skills are also a work in progress. 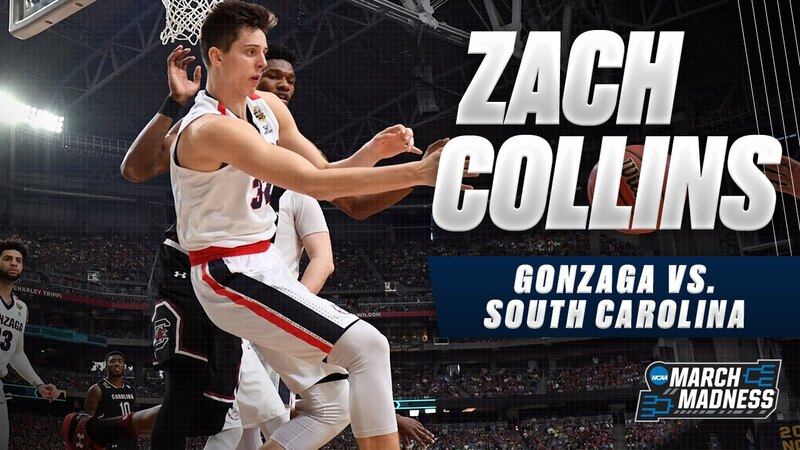 A one-and-done big man who played on Gonzaga’s national championship runner-up team, Zach Collins possesses two skills that are extremely valuable in today’s NBA: rim protection and outside shooting. Collins averaged 1.8 blocks in 17.8 minutes per game as a freshman. He swatted six shots in Gonzaga’s Final Four win over South Carolina in April. He “plays angry, like someone kicked his dog,” the Colorado Springs Gazette’s Paul Klee wrote earlier this month. On the offensive end, Collins is capable of scoring with his back to the basket and stepping out and sinking jumpers. His footwork in the post is impressive, and his shooting stroke looks smooth and repeatable. He knocked down 47.6 percent of his 3s, though it should be noted that he only attempted 21 the entire season. There’s a lot to like about Collins’ game, but if I were the Nuggets I’d be concerned about his fit next to Jokic. Collins averaged 6.2 fouls per 40 minutes. One of the weaknesses in Jokic’s game is his inability to play long stretches of the game without picking up fouls. Collins would also have to guard power forwards if he played with Jokic. Is he quick enough to handle that? That’s questionable. Make a list of the attributes you’d want in a power forward to pair with Jokic in the front court. Defensively, you’d want someone quick enough to switch screens, and long and athletic enough to challenge opponents at the rim. Jokic, for all his gifts, struggles to move laterally and often looks like he can barely jump over a deck of cards. So someone who can mask those flaws. On offense, you’d want a power forward who can hit jumpers and play above the rim but doesn’t try to do too much. Basically a player who can take advantage of Jokic’s passing gifts and won’t hijack the offense. What if I told you there is someone in this draft who could one day do all of those things? Jonathan Isaac would be a wonderful fit in Denver. He checks all those boxes. The problem is that it’s highly unlikely he’ll be available at 13. Most mock drafts have him going no lower than seventh. The Nuggets would in all likelihood have to trade up to get him. “The reason that some teams are very excited about him is he’s kind of the prototype of the modern NBA big man,” Fraschilla said. “Defensively, he is long and athletic, active, can block shots, can defend on the perimeter and move his feet in certain situations where he might have to switch onto quick, dynamic guards in pick and roll. Players in Isaac’s mold just don’t come around very often. Adam Mares of The Denver Stiffs proposed offering the Orlando Magic, who are picking sixth, Jameer Nelson, Malik Beasley, Wilson Chandler and the 13th pick. In return, Denver would get the sixth pick and Nikola Vucevic. If it were my decision to make for the Nuggets, I’d pull the trigger on that one. But what if Orlando wanted Chandler, Beasley, one player in the Harris/Murray/Hernangomez trio and the 13th pick in exchange for the sixth pick? That’s where it gets difficult. Thank God I’m not Tim Connelly.